Catholics in the Diocese of Shrewsbury are to be invited to respond to the challenges posed by the rapid secularisation of society by becoming active in the “New Evangelisation” that has been proposed by Blessed Pope John Paul II and Pope Benedict XVI. In a pastoral letter to be read out in churches across the diocese during Masses for the First Sunday of Advent, the Rt Rev. 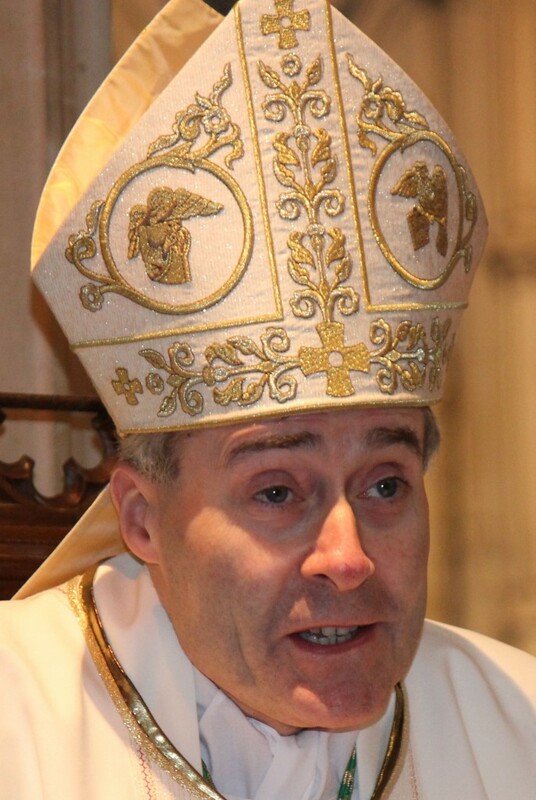 Mark Davies, the Bishop of Shrewsbury, will tell Catholics that both the future of the Church and the Christian character of the country will depend on the willingness of each of them to bear witness to Our Lord and His Gospel in their own lives. He will say that the call to a New Evangelisation comes in recognition by the Church that the changing situation of life in the early 21st century, particularly in the West, demanded a “new response from us all”. There was no strategy or long-term plan for this enterprise, the Bishop will explain, but that the success of the New Evangelisation would depend instead on deliberate commitments by each person to a “renewed love for Christ”. First and foremost the New Evangelisation must be rooted in prayer, Bishop Davies will say, which the faithful must make a priority. For this reason, Year of Faith prayer cards are being published by the diocese and they will be distributed throughout churches during Advent and Christmas. Bishop Mark Davies will say: “The Christmas celebration reminds us that Christianity lies at the foundation of our nation’s life. And yet, we are also aware that, of those 72 per cent of British people who declare themselves as ‘Christian’, so many are no longer actively part of a church or share a living faith. We see the Christian foundations of our society being challenged as never before, whether on questions concerning the sanctity of human life or the very identity of marriage. The Christmas celebration reminds us that Christianity lies at the foundation of our nation’s life. And yet, we are also aware that, of those 72 per cent of British people who declare themselves as “Christian,” so many are no longer actively part of a church or share a living faith. We see the Christian foundations of our society being challenged as never before, whether on questions concerning the sanctity of human life or the very identity of marriage. Our Holy Father, Pope Benedict, invites us to respond to this challenging situation by nothing less than a New Evangelisation. This may seem a surprising phrase; it evokes the “first evangelisation” which continues both at home and overseas where the Gospel is announced for the first time. What, then, is new about the New Evangelisation? It speaks to a new situation, the one we often meet today in our families, parishes and society. One Archbishop of Paris famously asked to be reminded – whenever he was in a crowded church – of the many people who were not there. At Christmas time, we cannot fail to think of many people who received the great inheritance of the Christian faith, but in whom “the light of faith has grown dim” (Pope Benedict XVI, Closing Homily Synod of Bishops, 28th October 2012). The need to announce anew our Catholic faith in Christ does not mean that the past work of our parishes has failed. New Evangelisation recognises that, together, we face a changed situation, one which demands a new response from us all. The Second Vatican Council, meeting 50 years ago, drew attention to the fact that most people would only hear the Gospel and know the Catholic Church through the members of Christ’s faithful whom they meet. In other words, each one of you listening to my letter today! I am often reminded of this in conversations with people outside the Church who immediately tell me of the Catholics they themselves know. The New Evangelisation involves us all. “from the loving knowledge of Christ there springs up in the believer the desire to evangelise and catechise, that is, to reveal in the Person of Christ the entire design of God and put people in communion with him” (Compendium of the Catechism n. 80). “the urgent need to proclaim Christ anew in places where the light of faith has weakened, in places where the fire of God is more like smouldering cinders, crying out to be stirred up, so that they can become a living flame that gives light and heat to the whole house” (Closing Homily Synod of Bishops, 28th October 2012). In the Diocese, we are setting up new commissions, and organising courses and conferences to help us meet this challenge. I realise, however, that what matters most is the influence of the lives of each one of you, and how you give witness to your Catholic faith amidst the difficult circumstances of our time. This must surely begin with prayer, much prayer. Indeed, Our Lord reminds us on this First Sunday of Advent, “stay awake, praying at all times …” (Luke 24:34). It is why, since becoming your bishop, I have emphasized the need to put prayer first. The prayer card for the Year of Faith reminds us that the New Evangelisation begins in prayer. At the time of year which stirs the embers of the memory of Christian faith in our country, we desire that all may come to know the light of the “Saviour who has been born to us: he is Christ the Lord” (Luke 2: 11).